The use of Robotic Process Automation (RPA) in the workplace is not a new technology trend. RPA Bots have been around for a while and are built for implementation into business processes to automate back-office and repetitive tasks such as: invoice processing, employee on-boarding, supply chain management, and so on. For a bot to operate, it needs access to a service license from a software company such as UiPath, BluePrism, AutomationAnywhere, etc. The company needs to pay for the program the bot is built and operates on. To give you an idea, only one bot can run on a license at a time, and you also need to be aware of how often they run and what tasks they’re doing because the bots need to run at the appropriate times in order to meet a clients’ Service Level Agreement (SLA). In other words, the bots need to complete all their requirements at the specified time the company needs them to. Bots are capable of running 24×7 and 365 days a year, but more often than not, it’s not necessary for them to do so. Depending on the company’s needs, all bots in production are most likely not needed to run all the time, bots can run during their set times of the day or week, in order to complete all their work which leaves time in the day that a bot is not running on a particular software license, therefore wasting resources by not taking full advantage of each purchased license. 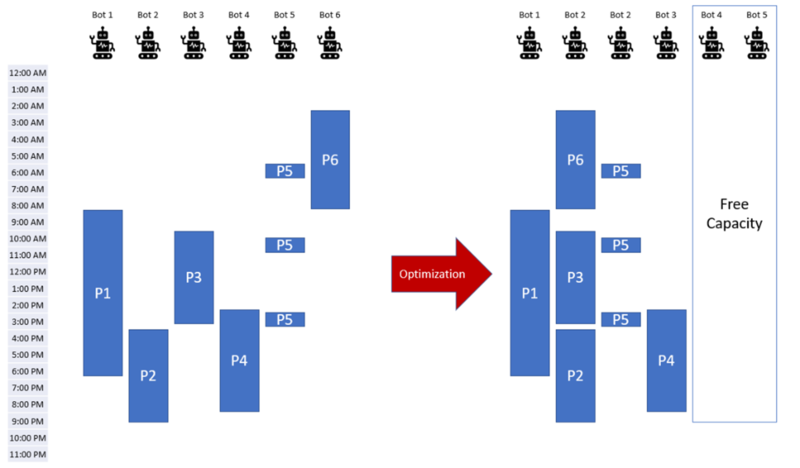 This is where Bot Optimization becomes key. What Happens When You Don’t Optimize? To scale RPA programs can become a bit hectic. Monitoring and ensuring that they run efficiently when workflow increases and the number of bots needed in production grow, leaves opportunities for optimization to be overlooked. For someone not trained in what to look for in an operating RPA Program, managing licenses and their respective expenses can also be a challenge. Since you can only run one bot per license at a time, the number of licenses, and therefore the cost of running the bots, increases. In order to meet this challenge, you must figure out how to ensure that there are no bot collisions (two bots running parallel to each other) or neither bot will be able to accomplish their tasks. At Accelirate, we consider the creation and management of bots an engaging process from start to finish. Like mentioned above, for non-experts, having several bots in production all with different tasks can cause an RPA program in general to become a bit hazy. However, our experts know what to look for and how to get the most out of each bot license. We have found that the best remedy for this problem is to tackle these challenges head on in order to more effectively manage resources through optimization. The key to bot optimization is to keep in mind at all times, the number of Bot licenses available and the business timing constraints of when the tasks need to be performed. So how do we optimize? Using a list of all the Bots and their respective processes, our team maps out what a day looks like with all of the Bots implemented and running. We do this to identify patterns and bot collisions then discuss how we can better optimize their usage while still maintaining the Service Level Agreements. We start by placing bots in columns that represent each day and shows what bots run under each license available. We then consolidate columns by placing bots into gaps of time during the day in which a license is being moved until we can no longer consolidate due to collisions. For example, say a bot runs for 3 hours each morning and another runs 4-5 hours at the end of each day, 2 licenses are not needed for these two bots, we can optimize by having these bots share one license because they do not need to operate at the exact same time. Next, we look to draw lines between bots that run at the same time as each other so we can determine which processes cannot be consolidated. By mapping out the bot activities and corresponding licenses we are then able to discover the number of places in which Bot activities must overlap in order to meet business needs. This number represents the minimum number of licenses required for our client to run all their bots daily to meet their process automation goals. Process A: Work Items arrive at random times through-out the day. Transaction completion time is 10 minutes. Average transaction volume is 30 transactions per day and the SLA to complete the transaction is 1 hour. Process B: Work Items arrive at the beginning of the day. Single transaction processing time is 5 minutes and SLA for completion of a single transaction is 1 day; Average transaction volume is 100 per day. Our Bot design would consider using a single bot to watch for transactions and place all tasks for Process B as lower priority items than Process A. This ensures that as soon as a task for Process A arrives, it is completed within a max SLA of 15 minutes (5 minutes to complete any in-flight tasks for process B + 10 minutes to process the transaction for Process A). Once the transaction for process A is completed the Bot goes back to processing transactions for Process B. The images below show an example of an unoptimized and optimized bot schedule. Notice how in the unoptimized schedule there are 6 bot licenses running 6 processes. By maneuvering the run times of each bot while keeping in mind the times of the day that certain bots are needed to complete their required tasks defined in the client Service Level Agreement, we were able to reduce the number of licenses needed from six to four. Because we understand how to identify parallels and consolidate, our Accelirate experts save clients’ money by making sure they are getting the most out of each Bot license that they purchase. Knowing what to look for and how to optimize bots is a priority in all Accelirate projects and we take pride in being able to increase the ROI clients see from implementing RPA into their business. Contact us at info@accelirate.com today to learn more about Accelirate Inc. and our intelligent RPA and AI services.